New Delhi, Aug 1 (PTI) Hit by allegations of corruption in the Commonwealth Games, the government today promised to take action against those found guilty even as another venue was inaugurated with a leaking roof. 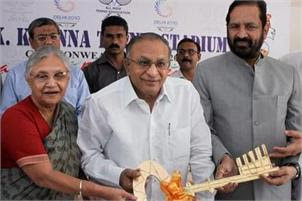 Union Urban Development minister S Jaipal Reddy was in damage-control mode over the Central Vigilance Commission's report on widescale corruption in Games' construction projects. "CVC has come out with preliminary remarks on the alleged irregularities in the construction of Commonwealth venues. I assure you that all concerned would be punished. Nothing would be spared. We will seriously look into it," Reddy said during the inauguration of the Weightlifting auditorium inside the Jawahar Lal Nehru stadium complex here today. The Games Organising Committee chairman Suresh Kalmadi, who was forced to address an hour-long press conference to rebutt charges of financial bunglings yesterday, was issuing clarifications yet again.